Description: Pro 120 is a industrial grade cloth duct tape. Application: Pro 120 is typically used in the HVAC industry on sheet metal and flex duct. 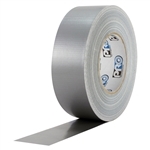 Pro 120 is a good utility grade duct tape used in the automotive industry and commercial trucks. Pro 120 is also used for carton sealing, book binding, seat repair, splicing, packaging, masking, holding and bundling. Benefits: Excellent holding power. Waterproof backing. Excellent conformability and tack. Easy unwind and tear. Excellent holding power.